How are you guys doing? Somehow am feeling happy for the past one week. My office has shifted to a new location with first-class amenities and am enjoying them. Yesterday was too good actually. They had pomegranate fruit infused water which I drank glasses and glasses 😀 Then in the evening, they conducted Housie Housie game which was lots of fun. My friend won a prize in that 😉 . 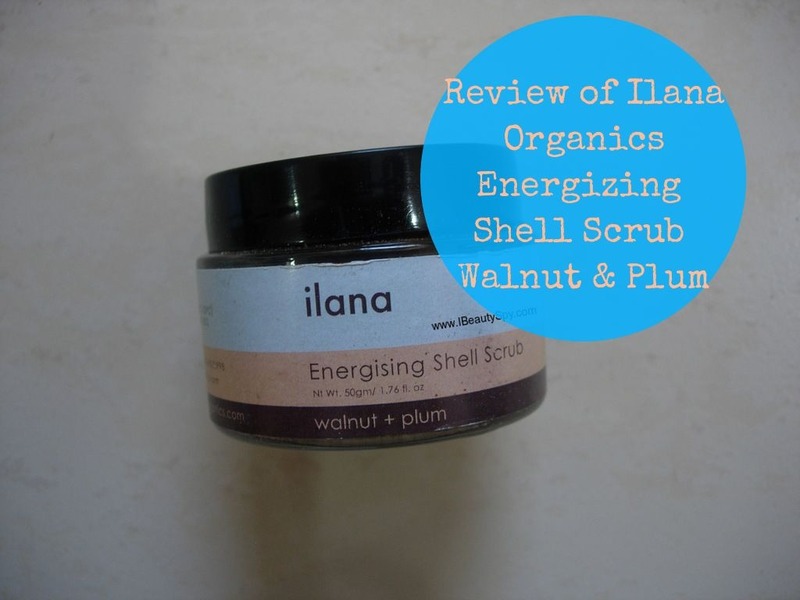 So coming back to today’s review, it is Ilana Organics Energizing Fruit Shell Scrub Walnut & Plum. This is my favorite product in their entire range they sent me. ‘Coz it so so potent. Want to know how? Read on to know more. Walnut shells are great for exfoliating as they delay ageing & get rid of dark circles. Black plum helps prevent acne, blemishes, wrinkles & pimples. Plums help prevent the skin from being lifeless and dull and makes it look refreshed and rejuvenated. Hibiscus increases skin elasticity & evens skin tone to give a stunning natural youth-boost. 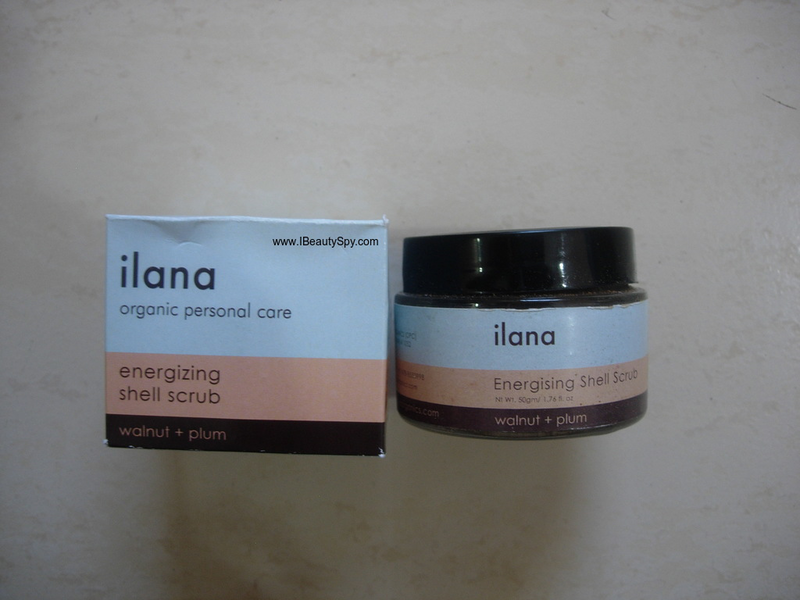 Ilana Organics Energizing Shell Scrub Walnut & Plum comes in an attractive glass jar packaging. It has a calming sandal and blue color labels. The designs, the fonts and the color choices are very appealing definitely. And I appreciate the glass jar packaging which is eco-friendly. Also it gives a luxurious feel to the product. 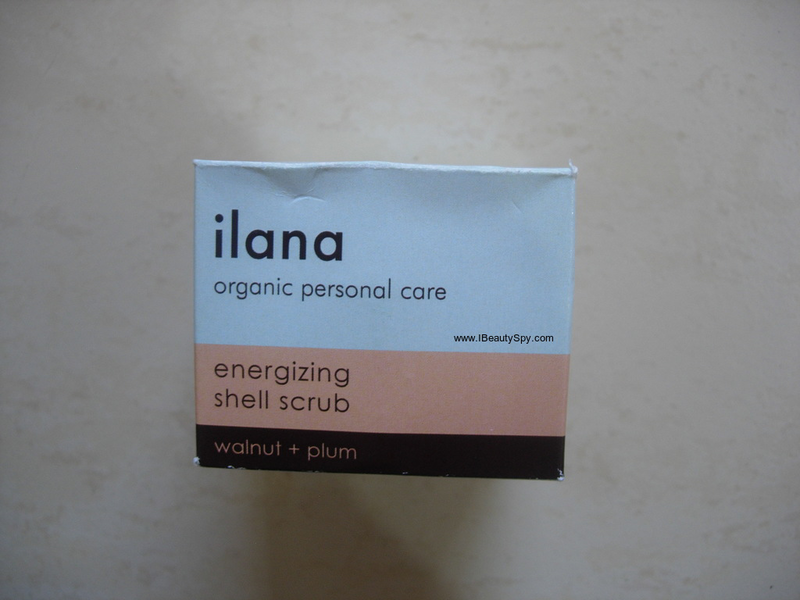 Ilana Organics Energizing Shell Scrub Walnut & Plum comes in slightly granular powder form. 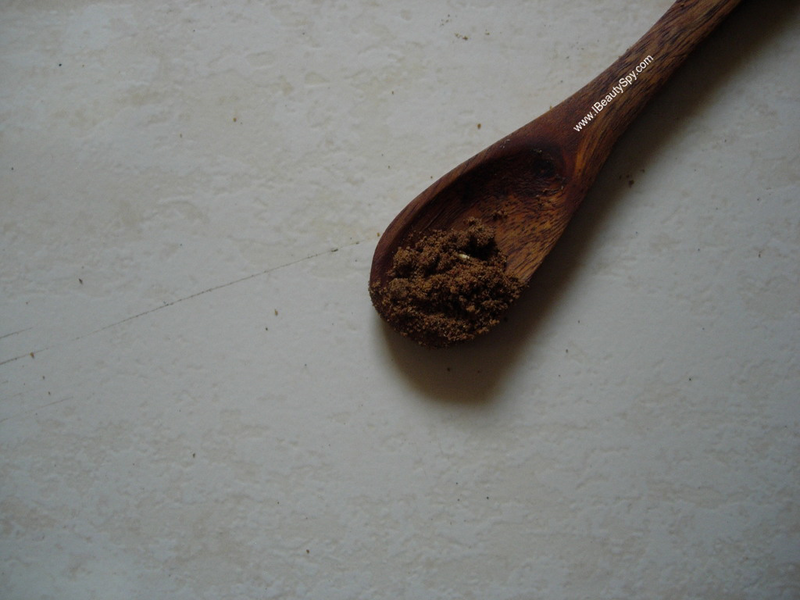 It is dark brownish color and has a herbal smell. I usually like products with herbal scents, so I kinda liked it. When I opened the jar, oh boy!, it was filled to the brim and brim with the powder and some literally spilled out 😀 . That gave me a good feeling. I have seen products where you open the jar and its only half filled. Somehow when its filled to the brim, you getting the feeling that you got a good value for money and you develop a trust in the brand. Brands like FE, Kama Ayurveda are some examples. 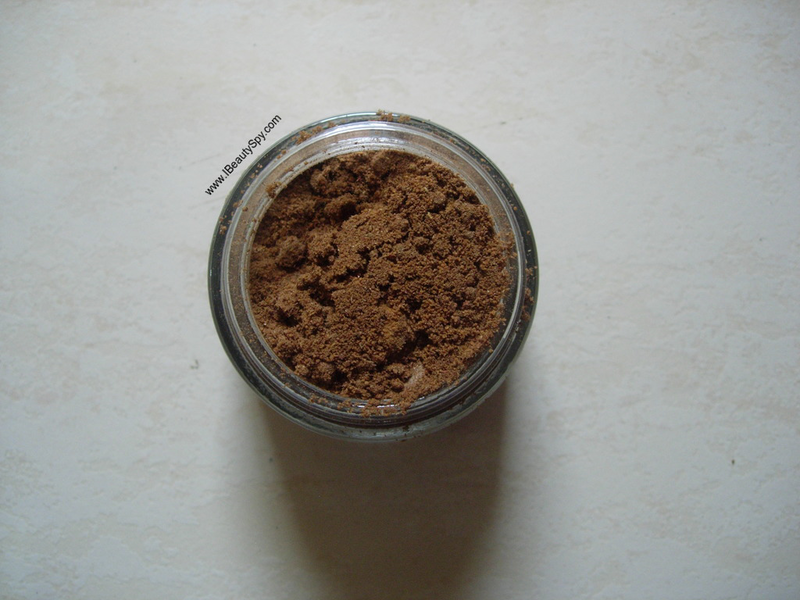 Since Ilana Organics Energizing Shell Scrub Walnut & Plum comes in powder form, it needs to be mixed in a liquid to activate it. I wouldn’t advise using water as the scrub particles are little big and would feel abrasive on the skin. I usually mix with curd or thick milk. You can also use aloe vera gel if you have oily skin. Also, if you mix with water, it will keep falling off and will be difficult. I like to apply Ilana Organics Energizing Shell Scrub Walnut & Plum mixed with curd as a thin layer on my face and leave on for around 20 minutes. Though its a scrub, I still use it like a face pack. ‘Coz I feel it has lot of good, natural ingredients in it which can only benefit when left on for a longer time. You can feel a slight tingling sensation, but nothing major. While washing, I would suggest you to scrub gently only else it might be harsh. Right from the first use, I could see brilliant effects. It lightened my skin and all my tan was removed. My scars were showing signs of fading and the pigmentation around my mouth seemed to get lighter after every use. And that was a stubborn pigmentation to say the least. I tried various products face packs, serums and oils around my mouth and chin area. But it stayed the same stubbornly. But with this product, my skin seemed to be loving it and responding beautifully. Now after three weeks of using, I can say the pigmentation has almost vanished. Only 10-15% left. Most of my acne scars have lightened so much. But what astonished me is the way how my skin looked so clear and clarified. I was looking like two shades lighter (well, that’s my natural color. I usually have heavy tan since I have sensitive skin that gets tanned super quick). While most of the tan removal products work well 70-75%, this seems to have completely lifted the tan! I love the way how my skin is looking even-toned now. 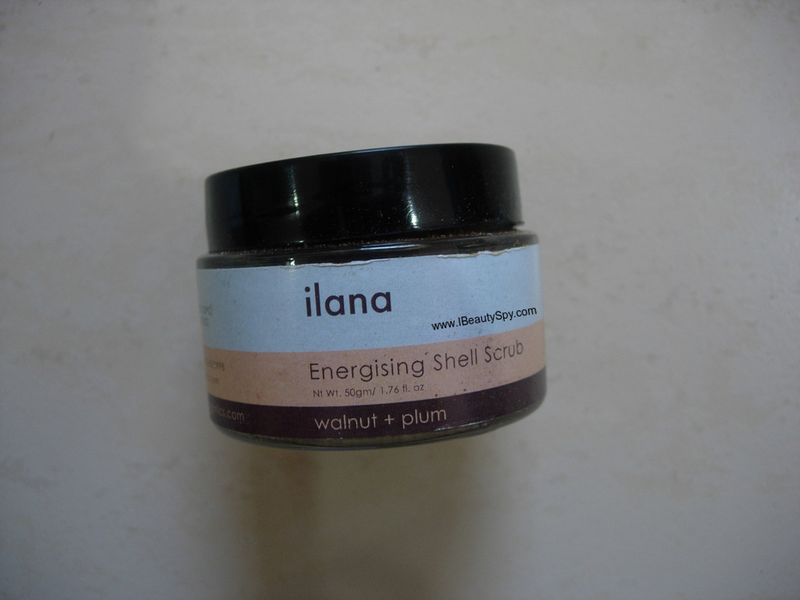 Apart from this, Ilana Organics Energizing Shell Scrub Walnut & Plum does the job of a scrub too very well. It exfoliates well and deep cleanses skin. Skin feels super smooth and soft. It is also effective in getting rid of whiteheads and blackheads. I can’t say if it will work on existing acne. But it can help in preventing acne as it thoroughly deep cleanses skin. The look and the feel of the powder felt pure and potent. And the performance proved it nonetheless! I would highly recommend this scrub. This is very apt for oily and acne-prone skin as it has oil control and mattifying properties also. But other skin types can also use it by mixing with curd. Yes, it satisfies all its claims and does even more. * 100% natural and organic ingredients list. * Comes in powder form, so no preservatives needed. * Lightens skin and removes tan 100%. * Reduces blemishes and acne scars. * Evens out skin tone. * Exfoliates and deep cleanses skin. * Makes skin super smooth and soft. * Gets rid of blackheads and whiteheads. * Glass jar packaging gives a luxurious feel to the product. Its worth every penny. Priced similar to other organic brands in the market. 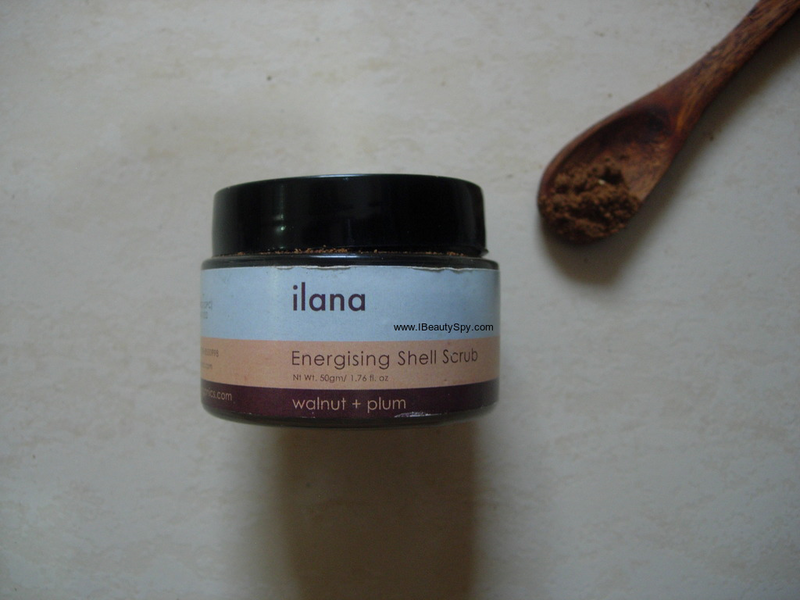 Ilana Organics Energizing Shell Scrub Walnut & Plum, true to its claims is a natural micro exfoliator. It just energizes and awakens your dull looking skin. And gives a fresh, clarified, radiant, youthful-looking skin. Someone who sees you might just think you have applied BB cream 😀 Oily and acne-prone skin people definitely need to try this. But I would recommend this to other skin types also who are facing dull and tanned skin. Also using a good, effective exfoliator in your routine can keep your skin looking young and delay signs of premature aging. That’s it for today folks! Hope you enjoyed this post! Let me know in the comments below. I’m quite fond of scrubs, but prefer a premixed formula. This brand needs to be checked though. Isn’t it pricey for the job it does!! Yes, its little pricey. But I found instant results with it. And its pure, organic as well. Hi, this is an in-depth review. Nowadays going with organic products is essential. I definitely try out this.